I've lived petticoats, I've talked petticoats, I've sold petticoats, I've dreamed petticoats- why, I've even worn the darned things! And that's more than any man will do for you. It's not an easy life for a woman- as the men are quick to remind her- there are long days and nights on the road and in hotels. The salesmen can hang out in the hotel parlors and joke with each other. Emma has to spend her evenings alone in her room. She has to be impeccably dressed or the men size her up instantly as 'that kind of woman.' "Morals don't figure with a man on the road, but when a woman breaks in this game, she's got to be on the level," as one character says. It's not fair but it's how it is. Emma is one tough cookie. She holds her own whether she's battling it out with the T.A. Buck's son, or her nemesis Ed Meyer, or a hotel manager trying to put her in the shabbiest room. Emma is one of the strongest females I've encountered in literature. Roast Beef, Medium is a collection of vignettes from the tenth year of Emma's career. Changes are afoot. Her son, 17 and full of himself, is about to start college, her boss is ill, and fashions are making petticoats obsolete. How will Emma face these challenges? I found reading Roast Beef, Medium a bit challenging myself. I enjoyed it but the dialogue is written in the vernacular of the times. Sometimes I'd read a line and think, "Huh? What the heck are they saying?" Emma is a strong character but she did romanticize homemaking a lot. Sure I like taking care of my home but there are days when I wish I could Tom Sawyer someone into cleaning my bathroom for me. She might say she just wants to bake pies but she loves her job too much. You can tell by the way she takes on any challenges. No one ever gets the better of her, she's too quick for that. If you're interested in a career woman from the past who wasn't a teacher or governess, I think you'll be impressed by Roast Beef, Medium. It's not a very long book either at only 126 pages. Recommended. You may not have heard of Roast Beef, Medium but you might know one of Edna Ferber's other novels including Show Boat (turned into musical), So Big (Pulitzer Prize 1924) or Giant. Giant was made into a movie starring Rock Hudson, James Dean and Elizabeth Taylor in 1956. 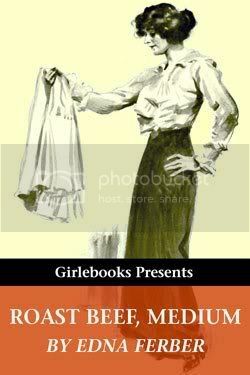 Roast Beef, Medium is a free ebook from Girlebooks and includes illustrations. Review originally published on Chrisbookarama.